They are used to diagnose conditions and plan the most effective course of treatment and to monitor how effective treatment has been. You will lie on a bed that is moved into the scanner either feet first or head first, depending on which part of your body is being scanned. The scanner will normally make a loud tapping noise when the images are being taken. You will usually be offered earplugs or headphones to screen out the noise. Throughout the scan you will be able to talk to the radiographer via an intercom. They will sit in an adjoining room but will be able to see you. It is important to keep very still to avoid the images becoming blurred. 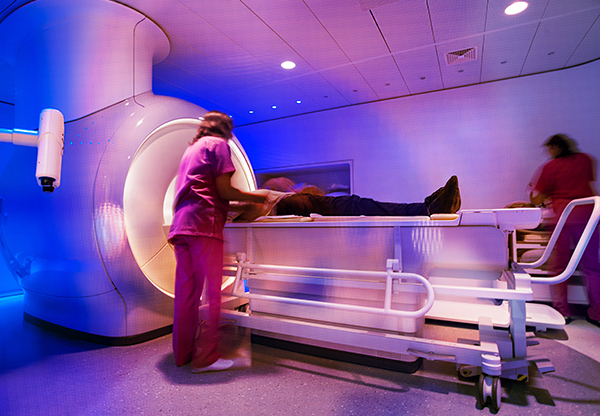 Scans normally take between 15 and 45 minutes depending on the body part or regions to be imaged. Before your scan you will normally be able to eat and drink as normal unless you are advised otherwise. You will need to remove jewellery and anything metallic from your body. In some cases you will be given an injection of contrast dye into the blood vessels or into the affected joint which can enhance the pictures taken to help your radiologist come to a diagnosis. You may also be given a sedative. Afterwards you can normally resume normal activities. However, if you have been given a sedative you will not be able to drive. A radiologist will review the results of your scan and you should receive the results within a few days. Protons lie at the centre of the hydrogen atoms in your body. They act like tiny magnets and are very sensitive to magnetic fields. When they are subjected to radio waves, the protons react, sending out radio signals that are picked up by the scanner. Protons in different tissues of the body react at different speeds and give off different signals. These signals are combined to create detailed images of the inside of your body. Because MRI scans use magnets rather than radiation they are relatively safe although they are not suitable for people who are fitted with a pacemaker and certain other types of implants. Talk to your doctor if you have any kind of metal implant, such as artificial joints, drug pump implant or intrauterine device. Some people find MRI scans claustrophobic. If this is the case you may be able to have a sedative or be imaged in an open-scanner.